This recipe is a Med Way version of a Southern classic that is sure to please. Using cauliflower in place of half of the grits adds vegetables and a lightness to the dish. The addition of mushrooms and onions to the grit mixture adds even more vegetables. You cannot miss with North Carolina shrimp. Topped off with prosciutto chips for a new take on an old classic. Combine cauliflower rice, grits, water, and salt in a large pot. Cook covered on medium heat stirring occasionally for 1 ½ hours. If mixture begins to stick, turn the heat down. Add additional water if needed, mixture should be completely cooked and creamy. Heat 1-2 teaspoons of olive oil in a medium sauté pan. Add mushrooms and cook until done, about 5-7 minutes. Place cooked mushrooms in a bowl. Heat 1-2 teaspoons of olive oil in a medium sauté pan. Add green onions and cook until done, about 5-7 minutes. Place cooked onions in the bowl with the mushrooms. When grits are done, add the mushrooms, onions, and cheese. Mix well to combine. Add shrimp and sauté for 2-3 minutes. Cook prosciutto on a griddle or in a large sauté pan. Use a bacon press if you have one to flatten the prosciutto. Cook, turning frequently until well done. 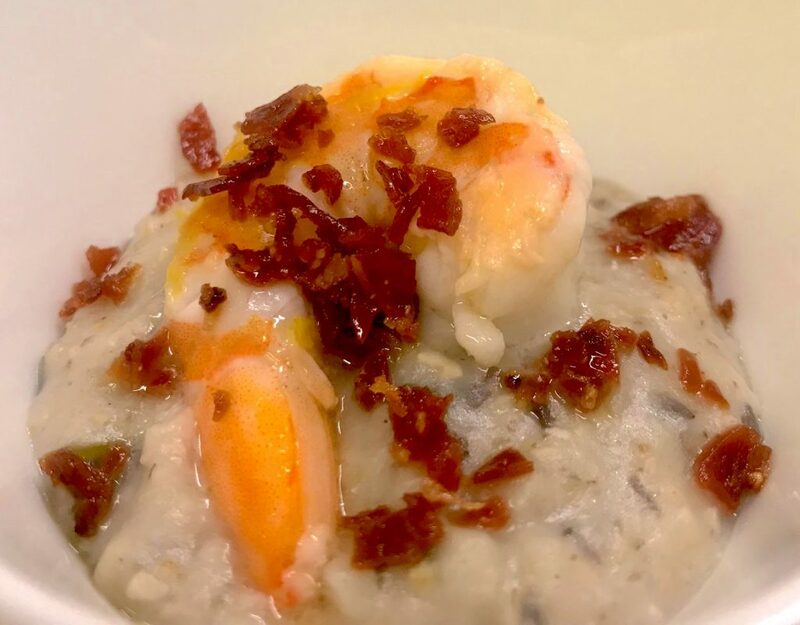 Build individual shrimp and cauliflower grit plates by placing ¼ of the cauliflower grits on each plate and then topping with ¼ of the shrimp and¼ of the prosciutto chips.